Dulas recently delivered the National Trust’s largest solar PV array in the UK at their grade I listed Llanerchaeron property in Wales. At just under 40 kWp (37.5kWp) and combined with the existing 7.5 kWp solar PV array, the installation should generate up to half of the electricity that the house requires. 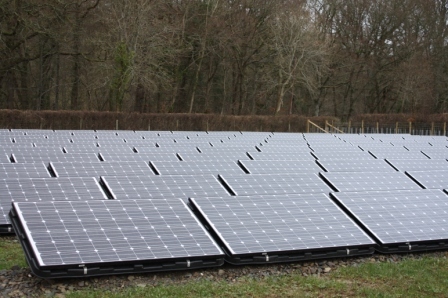 Having provided a full planning consultancy service for multiple solar PV sites across the National Trust portfolio in Wales, Dulas advised a free-standing ground mount ballasted array would provide the optimum solution to be delivered within tight timescales. Mike Clay of Dulas Ltd said of the installation: “By taking forward thinking steps and engaging with a highly experienced company the Trust has been able to best utilize the space available to gain maximum benefit from the feed in tariff. By prioritizing the installation Dulas was able to commission the project in time to take advantage of the highest feed in tariff rates providing the best possible financial rate of returns for the Trust.” The Trust has made a commitment to reduce its reliance on fossil fuels by 50% within the next eight years. It aims to cut carbon emissions from energy use for heat and electricity by 45%, beating the government’s target of a 34% reduction in CO2 by 2020.